Resigned to support duty in the key matches in the Women’s Team event earlier in the tournament; as play concluded on Saturday 8th September at the 2018 ITTF-Africa Championships in Port Louis, Mauritius, the name to note was that of Egypt’s Reem El-Eraky. 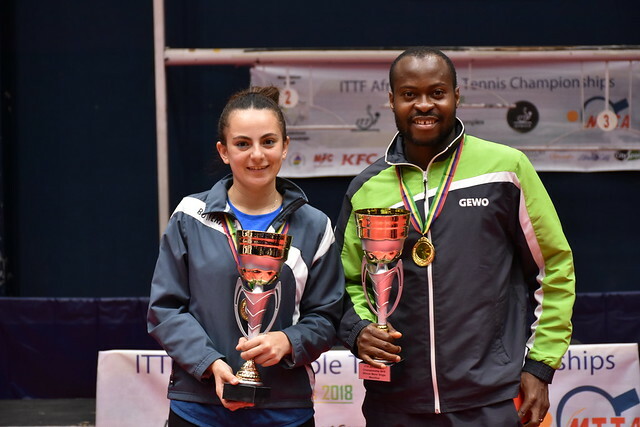 She booked her place in the semi-finals of the Women’s Singles event before partnering Farah Abdel-Aziz to Women’s Doubles gold; on both occasions keeping her nerve to emerge successful in seven game duels. Defeat for Ahmed Ali Saleh in the Men’s Doubles final but not in the penultimate round of the Men’s Singles event, where he has prevented a possible clean sweep of medals by Nigeria. He accounted for Bode Abiodun (9-11, 11-4, 11-9, 11-8, 11-5) in a round where the player to attract the attention was Olajide Omotayo.